The Union Stockyards in 1941. 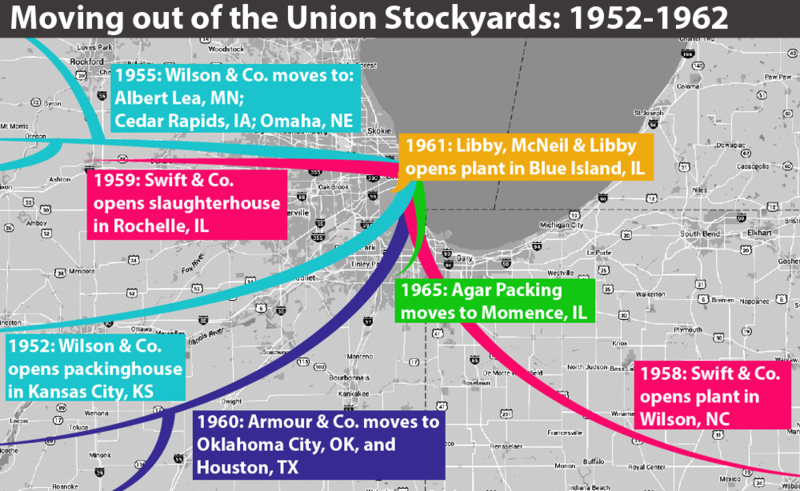 A depiction of the decline of the Union Stockyards as major meatpacking companies relocated. Based on Dominic Pacyga's book, Slaughterhouse: Chicago’s Union Stock Yard and the World It Made. Like a lot of American kids, Pam Monaco read The Jungle when she was in high school. In case you don’t remember, it’s Upton Sinclair’s 1906 indictment of the conditions in Chicago’s meatpacking industry at the time. And it left an indelible impression on her. Monaco says even when she was living in Kansas, she’d see livestock trucks heading north from Kansas and wonder if they were going to Chicago. So, not long after she moved to the Chicago area, Monaco asked Curious City whether there are any meatpackers left in Chicago and, if not, where they went. Does Chicago — the former hog butcher for the world — still do any of that kind of work? The short answer is “yes” and we’ll introduce a few of the shops that do. But what’s most interesting is what’s changed in the local industry. One hundred years ago the city was an international slaughtering juggernaut that helped establish a mass-market industrialized food system. Today, the remnants of slaughtering in Chicago are sustained by niche markets not well-served by that modern system: immigrant communities, trendy gourmands and people who cook traditional dishes in traditional ways. Why did Chicago become a &apos;Porkopolis&apos;? Dominic Pacyga, author of Slaughterhouse: Chicago’s Union Stock Yard and the World It Made, says the principle reason is that by 1865, the city was the nexus of at least nine rail lines, and that nexus put Chicago close to the center of the nation’s livestock growth areas. The center of activity was the Union Stock Yard, a concentrated square mile on the city’s Southwest Side. The yard acted as a market for the sale of large mammals: mostly cows, pigs and sheep. Some animals sold at the yards would be sent on to new owners beyond Chicago, but the rest would head for local slaughterhouses where they were killed, broken down and shipped out as chilled carcasses or canned and cured meats. Companies such as Armour, Swift and Morris used new processing technologies and the yards’ massive scale to become international meatpacking giants. For many decades, the number of animals that passed through the stockyards just got bigger. Pacyga writes that the whole thing peaked in 1924, when 18.6 million animals went through the stock yard. On a single cold day in December that year, he says, it took in more than 122,000 hogs. To handle those animals, the stockyards made jobs for an estimated 40,000 workers at at time. Early on many of the waste products from the animals ended up in the south fork of the Chicago River — a section unaffectionately dubbed “Bubbly Creek.” This improved a bit when meatpackers launched byproduct businesses that used the fat, blood, hair, organs and more to make soap, buttons, furniture stuffing, medicine, glue, paintbrushes, instrument strings, etc. Still, between the livestock, manure and the rendering plants, the smells generated could travel all the way to the North Side on hot summer nights. But this didn’t stop the tourists. As many as half a million a year flocked to the yard to see the latest in meat technology. This modern meat show even became a popular destination for Chicago Public Schools field trips. WBEZ volunteer Ed Kramer remembers going to the stockyards in 1941 with his 8th grade class. He says he remembers taking the ‘L’ from Wicker Park down to the yards and standing over the pens on a catwalk. Despite its popularity with the kids, the stockyards were already on the decline by the 1940s. Modern trucks and an extensive highway system made it easier to ship livestock to exact destinations by truck, rather than relying on fixed rail routes. Plus, farmers started to make deals directly with packing houses, eliminating the need to send their livestock to a central market. These circumstances shrank the number of animals moving through the yard. 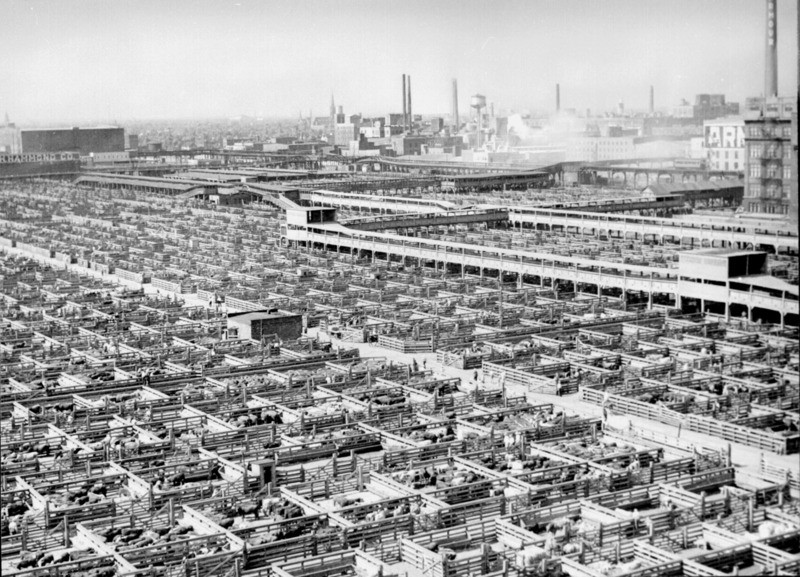 In 1970, fewer than 1 million hogs arrived at the yards, leading officials to close the hog market that year. The closing of the cattle market soon followed, and the stockyards closed their doors forever in February 1971. Today, hog and cattle slaughtering and butchering facilities are in small towns all over the Midwest — mostly in Iowa, Nebraska and Minnesota. They’re closer to farms, easy highways, cheap land and fewer neighbors to complain about the stench. There’s still a smallish meatpacking district near Fulton Street. The city also hosts 11 official slaughterhouses. These are mostly neighborhood spots that focus on poultry, but three process mainly sheep, goats and pigs. Those are: halal processor Barkaat, in the old Chiappetti plant at 38th and Halsted Street; Park Packing at 41st and Ashland Avenue; and the little Halsted Packing House at Halsted and Hubbard Streets. Even combined, the scale of these three processors is dwarfed by the scale of the former Union Stock Yard. Based on interviews with the operators, together they process approximately 1,000 animals per day, whereas the old yards could take in 100,000 hogs alone in a single day. These operations don’t share much with the old stockyards other than the fact that they all slaughter or process animals. During visits to two of the three remnant facilities — one slaughterhouse and one packing house (meaning: no slaughtering, just packing) — we see that these operations are almost an antidote to the mega industrial meat industry the Union Stock Yard helped established. Instead, they base their business on fresh custom cuts, personalized service and (sometimes) religious traditions. Halsted Packing House quietly operates on the 400 block of North Halsted Street, within walking distance of some of the city’s top restaurants. On most days, you’ll find a fresh stack of gossip magazines and either Cookie or Callie Davos at the front of the house. They’re sisters (trained respectively in chiropractics and accounting) who never expected to run a slaughterhouse. But then, one day in 1994, their father had a sudden heart attack. Twenty one years later the sisters still oversee a staff of mostly men between taking orders, balancing the books and greeting customers. Many of those customers are immigrants, like Joe from West Africa. You don’t get delicious meat without a kill floor, but the one at Halsted Packing House is nothing like the massive assembly line kill factories that epitomized the stockyards at their height. Here it’s just one small, intense room where young pigs bleed out, tumble in the dehairing machine, and then get disemboweled before heading to a large cooler. There, they join lambs and goats of various sizes. Although Halsted Packing House offers retail sales to the public, its no-frills presentations and earthy aromas can startle some. “There’s a lot of odd reactions you get when people walk in here,” Davos says. “They expect everything to be in a beautiful little plastic package and freshly scented smells in here. We actually slaughter and we have live animals come in, so we have all sorts of smells." Despite the support Davos receives from the city’s ethnic communities, she’s not sure the family business will last after her generation. Just about a mile away from Halsted Packing House is the old Fulton Market area. During a recent visit, Joe Maffei, owner of Grant Park Packing, watches dozens of already-eviscerated hog carcasses glide through his receiving room on hooks from a truck. Although meatpacking can include slaughtering, the meatpackers at Grant Park Packing are just in the packing part of the business: They break down carcasses into cuts for sale to delis, restaurants, stores and even home cooks who want special cuts like coppa or guanciale for curing. Pamela Monaco is a dean of graduate studies at North Central College in Naperville and a fan of public radio. Before coming to Chicago about two years ago, Monaco and her husband lived in Kansas, which also once hosted a big central stockyard. Today Monaco lives in Naperville with her husband and three cats, but says she spends her free time exploring Chicago’s food, theaters and museums. She was a little surprised by the outcome of the investigation she started on meatpacking.